After days of hard rain flooded mid-state homeless camps, groups who offer a helping hand to homeless people are bracing for another round of storms. 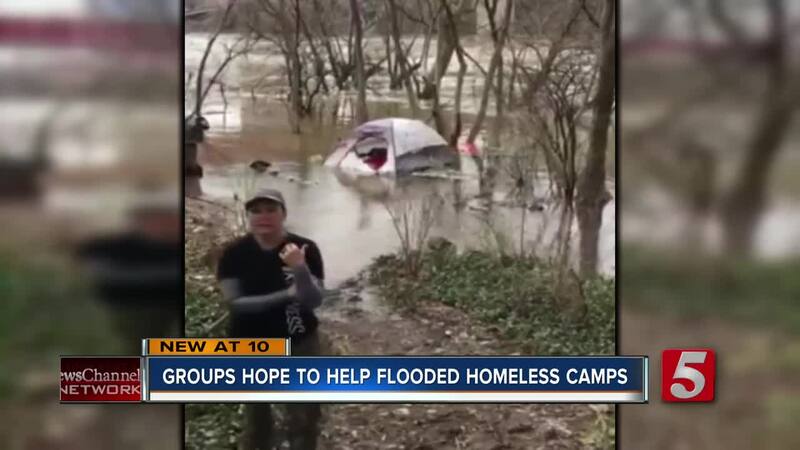 NASHVILLE, Tenn. (WTVF) — After days of hard rain flooded mid-state homeless camps, groups who offer a helping hand to homeless people are bracing for another round of storms. "We've got a lot of people who are hurting," Sherry Nicholson said. Nicholson is the founder of YAIPak Outreach, an organization that offers aid to people living on the streets. "The water rises and it wreaks havoc," she added. Nicholson said at one camp on the banks of the Cumberland River, floodwaters washed away tents and everything inside. She said in some cases, people lost all of what little they had. "Clothing, boots, shoes, socks everything they own, they've got to start all over again," Nicholson said. "You get them to that point of overcoming and all of the sudden something devastating happens and it sets them back." Nicholson said often times homeless camps are set up near waterways because it gives people a chance to bath and, in some cases, boil the water. YAIPak was able to help replace some of the items ruined last week, but with more hard rains on the way, Nicholson said she worries about what will happen. "We were able to start them all over with what they needed, but It can wipe out our resources," she said. You can find out more about YAIPak's mission and how you can help at their website.